Abstract: This work is dedicated to our late colleague Dr. Sandor Kovacs, who unfortunately died before the work was finished. 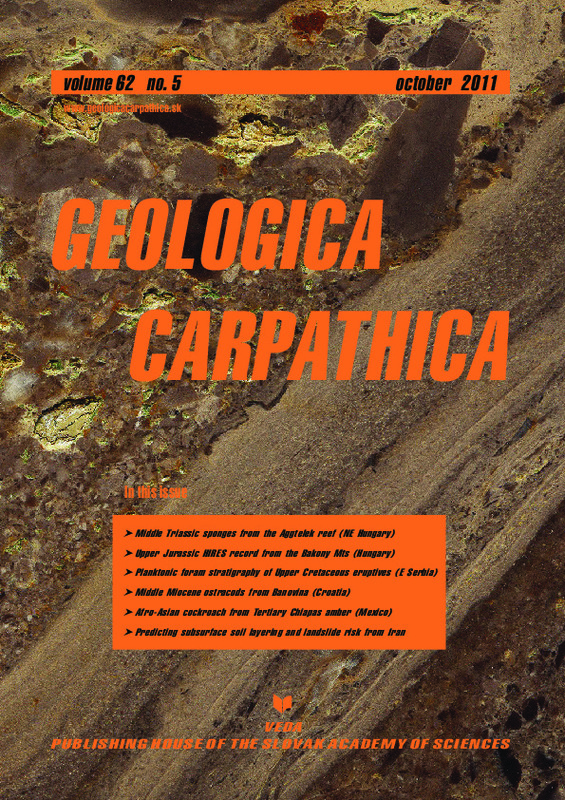 He collected the majority of the sponge samples described in this paper and the main result of the stratigraphy of the reef carbonates is his contribution. Abstract: The hypercalcified sponge fauna of the Middle Triassic (Anisian–Ladinian) reef limestone exposed between Aggtelek-Jósvaf?-Egerszög (northern Hungary) is described. Almost all the identified species are chambered sponges (“sphinctozoa”). Only two fragments of a not determinable species of non-chambered species (“inozoa”) were identified. Hexactinellid sponges are not found. The majority of the Middle Anisian “sphinctozoans” are absolutely different genera, not known from the Permian reefs. The sponge fauna of the Triassic pioneer reefs in the Aggtelek Karst are distinctly small-scaled occurring in “Tubiphytes”-dominated carbonates. The following taxa are described: Amblysiphonella sp., Celyphia zoldana Ott, Pisa & Farabegoli, Colospongia catenulata catenulata Ott, C. catenulata macrocatenulata Scholz, Follicatena cautica Ott, Kovacsia baloghi (Kovacs), Solenolmia manon manon (Münster), S. radiata Senowbari-Daryan & Riedel, Olangocoelia otti Bechstadt & Brandner, Thaumastocoelia dolomitica Senowbari-Daryan, Zühlke, Bechstadt & Flügel, Thaumastocoelia cf., Th. cassiana Steinmann. Abstract: This research focuses on the cephalopod fauna and biostratigraphy of the latest Jurassic succession of the Lókut Hill (Bakony Mts, Transdanubia, Hungary). Fossils were collected bed-by-bed from Ammonitico Rosso facies and from the subsequent Biancone type rock. The poorly preserved cephalopods from the lowermost part of the profile, immediately above the radiolarite, may represent a part of the Oxfordian stage. The rich Kimmeridgian ammonite fauna is published for the first time while the formerly illustrated Tithonian fauna is revised. All the successive Kimmeridgian and Early Tithonian Mediterranean ammonite zones can be traced. The highest documented ammonite zone is the late Tithonian Microcanthum Zone. The beds above yielded no cephalopods. Particular attention was paid to the belemnite fauna of over 120 specimens collected under strict ammonite control. Among the belemnite faunas an Early Tithonian, an early middle Tithonian, a late middle Tithonian, and a latest Tithonian assemblage can be distinguished. Thereby, an association is distinguished in the middle Late Kimmeridgian and one that characterizes the Oxfordian-Kimmeridgian boundary beds. The main difference from previously published belemnite data appears to be that the Hungarian assemblages are impoverished with respect to contemporary faunas from Italy and Spain (Mediterranean Province). An isotopic analysis of the belemnites show that the carbon-isotope data are consistent with carbon-isotope stratigraphies of the Western Tethys and show a decrease in values towards the Jurassic-Cretaceous Boundary. Abstract: The biostratigraphy of the Upper Cretaceous volcanoclastic-sedimentary formations cropping out in the Timok Eruptive Area of the eastern Serbian Carpatho-Balkanides is presented. Four lithostratigraphic units of formation rank are recognized in the Timok area: Stublica Clastics (Upper Albian/Cenomanian), Ostrelj (Lower Turonian/Santonian), Bor Clastics (Campanian/Maastrichtian) and Bukovo (Campanian/?Maastrichtian). Forty two species of planktonic foraminifera have been determined in the studied area. Eight planktonic foraminiferal zones of Middle Cenomanian through Middle Campanian age have been recognized. These are: Thalmanninella reicheli Interval Zone (Middle Cenomanian), Rotalipora cushmani Taxon Range Zone (Upper Cenomanian), Helvetoglobotruncana helvetica Taxon Range Zone (Lower Turonian), Marginotruncana sigali–Dicarinella primitiva Interval Zone (Upper Turonian to lowermost Coniacian), Dicarinella concavata Interval Zone (Lower Coniacian to lowermost Santonian), Dicarinella asymetrica Taxon Range Zone (Santonian), Globotruncanita elevata Interval Zone (Lower Campanian) and the Globotruncana ventricosa Interval Zone (Middle Campanian). The scarcity or lack of zonal species in the Lower Cenomanian and Upper Campanian/Maastrichtian strata prevents recognition of the nominal zones. The Upper Cretaceous planktonic foraminiferal zones from the Timok Eruptive Area are correlated with coeval zones from adjacent regions of Bulgaria and Romania and from other Tethyan regions. Abstract: In this paper we present the results of the investigations on the Badenian (Middle Miocene) ostracods from the Pokupsko area. For the first time the presence of Badenian aged sediments in Croatia can be supported by the occurrence of ostracod biozonal markers. Four Badenian ostracod zones are established: Lower Badenian Biozone NO7 Acanthocythereis hystrix–Bythocypris lucida, Middle Badenian Biozone NO8 Eocytheropteron inflatum–Olimfalunia spinulosa, and the two Upper Badenian Biozones NO9 Neomonoceratina laskarevi–Miocyprideis sarmatica elongata and NO10 Carinocythereis carinata–Phlyctenophora farkasi. On the basis of the generally accepted paleoecology of selected genera, we identified the following ostracod faunas: shallow-water marine, shallow-water brackish-marine, shallow-water reef, and deep-water marine. The paleontological and trace element analyses suggest that the Pokupsko ostracod fauna lived in shallow (50 m deep), warm, and limpid waters, connected to a deeper sea and occasionally exposed to freshwater inflows. Abstract: Cockroach genera with synanthropic species (Blattella, Ectobius, Supella, Periplaneta, Diploptera and ?Blatta), as well as other insects such as honeybees, although natively limited to certain continents nowadays, had circumtropic distribution in the past. The ease of their reintroduction into their former range suggests a post-Early Miocene environmental stress which led to the extinction of cosmopolitan Tertiary entomofauna in the Americas, whilst in Eurasia, Africa and Australia this fauna survived. This phenomenon is demonstrated here on a low diversity (10 spp.) living cockroach genus Supella, which is peculiar for the circumtropical synanthropic brownbanded cockroach S. longipalpa and also for its exclusively free-living cavicolous species restricted to Africa. S. (Nemosupella) miocenica sp. nov. from the Miocene amber of Chiapas in Mexico is a sister species to the living S. mirabilis from the Lower Guinea forests and adjacent savannas. The difference is restricted to the shape of the central macula on the pronotum, and size, which may indicate the around-Miocene origin of the living, extremely polymorphic Supella species and possibly also the iso¬chronic invasion into the Americas. The species also has a number of characteristics of the Asian (and possibly also Australian) uniform genus Allacta (falling within the generic variability of Supella) suggesting Supella is a direct ancestor of the former. The present species is the first significant evidence for incomplete hiati between well defined cockroach genera — a result of the extensive fossil record of the group. The reported specimen is covered by a mycelium of a parasitic fungus Cordyceps or Entomophthora. Abstract: This paper is concerned principally with the application of Artificial Neural Networks (ANN) in geotechnical engineering. In particular the application of ANN is discussed in more detail for subsurface soil layering and landslide analysis. Two ANN models are trained to predict subsurface soil layering and landslide risk using data collected from a study area in northern Iran. Given the three-dimensional coordinates of soil layers present in thirty boreholes as training data, our first ANN successfully predicted the depth and type of subsurface soil layers at new locations in the region. The agreement between the ANN outputs and actual data is over 90 % for all test cases. The second ANN was designed to recognize the probability of landslide occurrence at 200 sampling points which were not used in training. The neural network outputs are very close (over 92 %) to risk values calculated by the finite element method or by Bishop’s method.